Each member of our community is encouraged to seek discernment and enactment of their God-given gifts for ministry. The Altar Guild performs the ministry of Altar preparation for the celebration of the Eucharist. This group of ministers is responsible for setting up for the mass held on Sundays, Holy Days, and other Sacramental services such as Baptisms, Weddings, and Funerals. Both men and women are welcome to participate. Choirs/Music: We have a thriving Senior Choir and Junior Choir at CHS as well as opportunities to participate in instrumental music, holiday choirs, and bell ringing. More information on the choirs can be found by clicking on Music. Ushers help with the seating, offering, etc. during both services. This is done on a rotational basis. Men and women are both welcome. An acolyte is a lay person who assists in worship by performing such functions as carrying the cross in procession, assisting with lighting and extinguishing candles, and helping with the presentation of the bread and wine if necessary. All children third grade and older are welcome to become acolytes. There is a required training session held twice a year for all those interested. 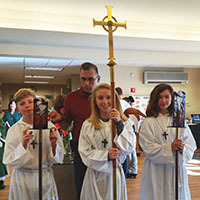 Acolytes are first assigned as Torchbearers (holding and extinguishing candles) and promoted to Crucifier/server (carries the cross at the head of the procession) in the 7th grade. ​Lectors lead our congregation in the reading of the Scriptures and the Prayers of the People during both services. Lay Eucharistic visitors extend the Altar rail to the homebound, the sick, and to those in nursing homes, enabling them to participate in the Eucharistic Celebration. Anyone who is a communicant in the Episcopal Church is welcome to train to become a Lay Eucharistic Visitor. Lay Eucharistic Ministers assist the priest in serving the elements during both services. Again, anyone who is a communicant in the Episcopal Church is welcome to train to become a Lay Eucharistic Minister. There are so many ways that you can participate in the life of the Parish. The ministry of the Community committee includes support for our parish family in many fun ways. One of our duties is to organize refreshments for various church functions, but we are NOT just a "cookies and punch" committee! We are also available to help those within our church who may need assistance of various sorts, such as home visits, meals delivered, or just a friendly ear. This is a very caring community of faith. If you are ever in need of a helping hand, you can either call the office or contact the Vestry liaison for community via email at help@churchholyspirit.org. We are always ready to help in whatever way we can. Parish Annual Meeting: calls are made to provide refreshments during the meeting, as well as finding volunteers for set-up and clean-up. Babysitting is also arranged. Shrove Tuesday Pancake Supper: we serve a dinner of pancakes and sausage to celebrate our version of Mardi Gras! Jazz music and festive decorations help set the mood. Help is needed for shopping, set-up, cooking, serving and clean-up. Lenten Supper & Study: This weekly event meets on Wednesday evenings during Lent. One volunteer is needed for each week, to prepare a few pots of soup and provide bread for the group's supper. Maundy Thursday Potluck: this is a true potluck, so you never know what you might find for dinner! This dinner symbolizes the Last Supper and is served right before the Foot Washing Service. Set-up and clean-up crews are needed. Good Friday Day of Service: We minister to our own by preparing a continental breakfast for workers in the morning and also a soup supper upon their return in the evening. Volunteers are needed for set-up, clean-up, and to prepare breakfast foods and soup. Parish Picnic: This is our BIG event! The picnic is help at the end of the Sunday School season. Everyone brings a salad and dessert to share. The drinks and hamburgers and hot dogs are supplied by us. A lot of help is needed-set-up, cooks, and clean-up. Also needed are a few people to organize fun and games for the young and old (the messier the better)! This is always a fun day - even if it rains! Coffee Hours: Volunteers are needed to host coffee hour after the 8:00 a.m. or 10:00 a.m. service. Hosts prepare coffee and provide a few treats (coffee cake, donuts, etc.). This is also a great way to get to know one another better! Youth Education: Opportunities abound to be Christ's heart and hands to our CHS youth. The only prerequisite is a love for children and learning. Sunday School meets at 9: 45 AM. Classes are offered from pre-school on up through high school. Most classes are team taught by three teachers - that is, one teacher teaches for 3-4 Sundays, and then is off for 8 Sundays. Thus the burden on each individual is light - but the reward is great! CHS also offers a one week Vacation Bible School in the summer, during which lots of hands are needed. Please consider utilizing your gifts of time and talent to serve our children - not only is it fun and challenging for you as a teacher, it is a priceless gift to our children. For more information about this service opportunity, please talk with the Sunday School Directors or contact the Vestry Liaison - Education through the church office for more information. Adult Education: If you feel called to assist with the adult education programs, please contact the Vestry Liaison - Adult Education. Evangelism: At Church of the Holy Spirit, Evangelism means many things. Mostly, it means reaching out to new members in our community. We do this in several ways. When a visitor comes to Church of the Holy Spirit we ask that the visitor complete an information form found in the Sunday bulletin. This form is processed by the church office and is given to the Vestry member responsible for Evangelism. The Vestry member then calls the visitor to see if more information about the church can be provided. Each new member family, if they like, receives a new member packet. This packet provides information about the many different areas about the church. Much of the information on this web site was obtained from the information in the new member packet. This packet also contains a form to order a Church directory and a pledge form. For any new member/visitors who wish, their family is assigned a "Buddy". A "Buddy" is an existing member of the church who helps the new family become aquainted with Church of the Holy Spirit. They do this by introducing the new family to other members of the church, answering any questions the new family may have, or anything to make the new family feel welcome. Newcomers to Holy Spirit and others interested in an overview of the Episcopal expression of Christianity are invited to attend the Adult Inquirer's Class held twice a year. This class begins with a "Welcoming Breakfast". Led by Father Phil, the class explores church history, church customs, the Bible and more. Several times during the church year, during the Sunday morning 10:00 am service, the Rite of Welcome is performed. This brief ceremony formally welcomes a newcomer, or anyone, as a member of the church. The newcomers are asked to pick a sponsor, who stands with them, while they state their intentions to be a member of the church. The priest then blesses them and the congregation as a whole welcomes the new members to the church. The property committee is responsible for the buildings and grounds at the Church of the Holy Spirit. There is always something to do! If you are interested in helping out (you don't have to be a carpenter, plumber or electrician - but we certainly won't turn them away ;-) please send John Higgins an email (vestry.property@churchholysspirit.org), contact the office to volunteer your time. We would be glad for the assistance! Many hands make light work! Stewardship is a way of life. Being a good steward means being generous with your time, talent and treasure. Stewardship is an expression of love--God's love for you and your love for God in return. Jesus is the perfect example of stewardship. He used every gift, including His life, to glorify and serve God. Make sharing a top priority of your life! As our parish family grows, it's important that we communicate well to each other as well as to the outside community and potential future parishioners. The Communications Vestry Liaison and the Communications Committee publish and maintain Holy Spirit's website as well as an annual Parish Photo Directory. The "Trumpeter" is our monthly church newsletter, which provides parishioners with information about upcoming events and reports on items of interest that have taken place in the past month. Outside publications such as the Courier-News, The Hunterdon County Democrat, and the Star-Ledger are utilized to communicate with the communities around us and encourage others' participation in our parish life. We try to keep the community aware of events that may be of interest, such as concerts, auctions, sales, etc. Area newspapers and similar publications are contacted via email, fax, or phone when we have print material of interest. The communications committee also keeps an eye out for a "feature story" that might be of interest to the local newspapers. If you would like to provide your email address to us, we will record it in our directory and communicate with you over email as appropriate. Please send your email address to webmaster@churchholyspirit.org and a copy to our administrator, at admin@churchholyspirit.org.